Using the (rather) new multiple account sign-in feature, I can access two or more gmail boxes: I need to sign-in to my mail account, and then choose to sign-in to another account and fill my other username/password. But, is it possible to save all my login data so that when I access my main account I can switch to the other one(s) immediately, without the need to re-enter the secondary username(s) every time? You don't need to sign in again, as long as you have left the "Stay signed in" checkbox, and you don't clear your cookies. I switch all the time between 2 accounts... never have to fill out my password. 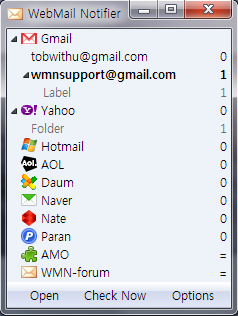 If you have Firefox, you can use WebMail Notifier to be able to login to 2 Gmail accounts. Your usernames and passwords are automatically saved and can be protected by Firefox's Master Password feature. If you are using Google Apps you can delegate access from one address to the another inside the same domain. To do this in the log in to the account you want to grant access to, switch to your inbox, select Settings -> Accounts -> Click "Add another account" after "Grant access to your account" .